In the time of Apple’s iOS and Google’s Android mobile operating systems dominating the market, there is little space for competitors. RIM’s BlackBerry phones, even their latest efforts, are not selling, and Microsoft’s Windows Phone seems to be unable to gain a foothold. We’ve heard little parcels of information about Mozilla’s new Firefox OS, also known as Boot To Gecko, or B2G, for a while now. But there is no space for another minority contender in the market, is there? After all, even Windows Phone, backed by Microsoft, can’t even excite consumers anymore. But Mozilla, as much as I’m embarrased to say they’ve succeeded in ruining Firefox and Thunderbird for years now and are barely just fixing things again, took a different route. Rather than trying to build yet another high-end smartphone to compete with the iPhone or the Galaxy S4, they decided to create a low-end phone for users that could not afford or didn’t want such a fancy device. And out of the red panda’s womb popped the ZTE Open, an unlocked carrier GSM device that costs just $80 on eBay (well, the initial run did; now you’ll have to do what I did and bid to double that to score one until they manufacture another wave to stock eBay’s virtual shelves). ZTE and/or Mozilla pulled a page from Apple’s book. The box is cleanly designed; the phone is front, top, and center once you remove the outer shell and lift the lid of the box. Underneath the phone lie the instructions, warranty sheet, MicroUSB charger, and a hands-free earpiece with built-in mic. The large battery is included as well; this is not installed by default and you’ll need to do that. Unfortunately, the phone does not include a MicroSD card, but more on that later. The charger is rated at a measly 0.75A, at the typical USB voltage of 5V. I was hoping for a 1A power supply for faster charging and less heating but it’s probably not too big of a deal. The hands-free is of decent quality, which is impressive given the low price of the phone. The stock ZTE battery is rated at 1200mAh, or 4.5Wh, and operates at 3.7V. According to the specs it’s got a charging voltage of 4.2V. Battery model # is li3712t42p3h654246h. The ZTE Open itself is black and orange. The back and surrounding of the phone is the metallic orange color while the bezel of the screen and a sort of ring around it are a glossy black color. On the front of the phone is the 3.5″ capacative touchscreen with a resolution of 320×480. With a pixel density of approximately 165 PPI, this is nowhere near the quality of the “Retina display” used in an iPhone, but for a phone that’s 1/10th of the cost it is respectible. Under the display is the home button, which is represented as a small white circle. On the top, we have the headphone/mic jack on the left side and a small power button the right side. On the left side toward the top is the volume rocker. Nothing is on the right side of the phone. On the bottom of the phone, in the center, is a standard MicroUSB connection for charging the phone. While it should be compatible with any MicroUSB charger, be sure to use a quality unit rated at 5V and no less than 0.75A to charge the phone. Finally, the back of the phone has the camera lens, the speakerphone slot, the ZTE logo, and a Firefox OS logo. Since this is an unlocked phone that can be used with any GSM-based carrier, there are no carrier logos or branding to be found on the device or accessories. Overall the phone does not look as good quality as my LG Optimus G or any other high end smartphone, but it’s unique color and design give it an edge over other low-budget smartphones. if you consider the low price tag, you can appreciate how good the phone turned out. 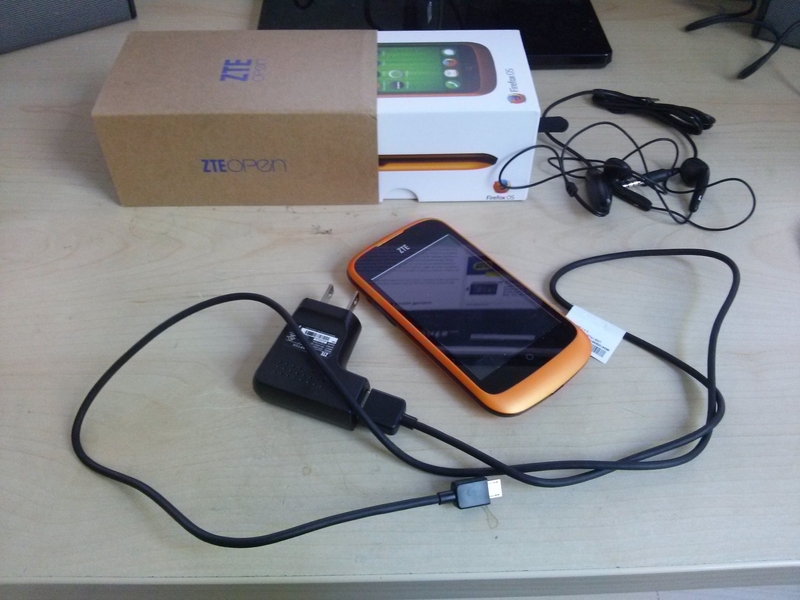 Mozilla’s Firefox OS comes preinstalled with this phone. It’s got it’s quirks, but this is expected of a new platform, and even though the phone only has a single-core 1GHz Qualcomm Snapdragon processor, a weak Adreno 200 GPU, 256MB of RAM, and a paltry 512MB of storage, it is susprisingly responsive, smooth, and functional. As a phone, the ZTE Open does a fantastic job. Signal strength was comparable to much higher-end devices, as well as that of a relatives Nokia flip-phone, so no matter whether you’re moving to something simpler or this is your first smartphone, you will not be disappointed. Keep in mind this was tested with AT&T, and how good of service you get varies by carrier, location, or environment, but this comparison simply serves as a baseline to other phones in the same carrier, location, and environment. Calls sounded better than average with both the phone’s built in speaker and the earpiece, but the speakerphone lacked clarity and volume. The person on the other end of the line had no problems hearing my voice through both the phone’s built-in mic and the microphone in the included hands-free kit. The 3 Megapixel camera is a disappointment, compared to those found in more expensive phones or compared to a standalone digital camera, but again, we must consider the price of the phone before counting this against the phone’s overall scoring. Battery life was significantly better than that of more high-end smartphones, but worse than feature phone users would expect. The ZTE Open, powered by Mozilla’s new Firefox OS is an excellent choice for users coming from feature phones (aka “dumb” phones), but it’s not going to replace your iPhone anytime soon. At the price point of $80 and the option to use it with any carrier that utilizes the GSM cellular network (MetroPCS, T-Mobile, AT&T, and many more), it’s a bargain. if you do plan to use it for playing music files or to take any pictures, remember to pick up a MicroSD card.